The Optos Daytona Optomap retinal exam is revolutionizing how eye exams are performed. While eye exams generally include a look at the front of the eye to evaluate health and prescription changes, a thorough screening of the retina is critical to verify that your eye is healthy. This screening can lead to early detection of common diseases, such as glaucoma, diabetes, macular degeneration, and even cancer. The Optos Daytona Optomap is a scanning laser opthalmoscope that allows the doctors to view different layers of the retina. 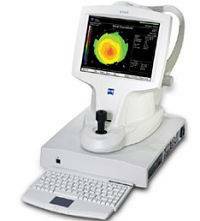 The Optos Daytona Optomap takes a high resolution, 200 degree wide, color digital image of the retina, which can be immediately evaluated by our doctors. This amazing device allows your eye doctor to see retinal, optic nerve and cornea structures not visible through regular exam methods by using light to provide a high resolution scan meant to pick up early signs of structural change or disease. This allows your eye doctor to see even the smallest changes in the retina and optic nerve with greater accuracy, and much higher definition, making early and accurate detection of common sight threatening eye conditions such as glaucoma, macular degeneration and diabetic retinopathy easier than ever before. * More than 1.1 million Americans are legally blind. An additional 50,000 people lose their sight each year, yet nearly 1/2 of all blindness can be prevented. * Blindness is the #1 complication of diabetic patients. Diabetic retinopathy is the leading cause of new cases of blindness. * People over the age of 65 have a 30% chance of developing age-related macular degeneration, which gradually destroys sharp, central vision. The Optos Daytona Optomap is a simple, quick and comfortable way to maintain optimum eye health. Dr. Beyer recommends that all of his patients have this exam. Don’t you and your family deserve the best eye care available? 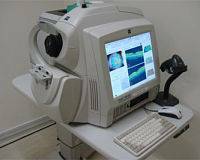 Big Sky Eye Care has acquired the latest in OCT (Optical Coherence Tomography) Technology. The Cirrus OCT is a high definition retinal scanning instrument which is becoming the industry standard for retinal disease diagnosis, management and treatment. The OCT technology has elevated our level of care by providing cross-sectional views of the retinal nerve fiber layer, macula, optic nerve and even the anterior segment of the eye. The new Guided Progression Analysis compares measurements over time and determines if any statistically significant changes have occurred, which means earlier diagnosis and treatment. The OCT is the most valuable instrument used in managing glaucoma, macular degeneration and diabetic retinopathy. Highest quality lens tracer backed by a dependable and experienced support team. National Optronics manufactures patented finishing equipment designed for organic lens processing. At Big Sky Eye Care we turn around your lenses with accuracy and ease. 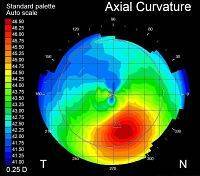 Corneal topography produces a detailed, visual description of the shape and power of your cornea. 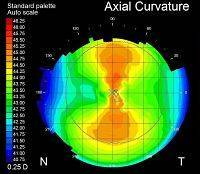 This type of analysis provides the doctor with very fine details regarding the condition of your corneal surface. These details are used to diagnose, monitor, and treat various eye conditions. They are also used in fitting contact lenses and for planning surgery, including Lasik and PRK. The images below show the incredible detail that the Zeiss topographer captures. This instrument checks for corneal thinning, which is a risk factor for glaucoma, and it is also a critical assessment tool for Laser Vision Correction. 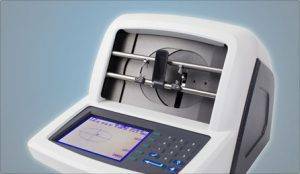 The Auto Lensometer is used to get an accurate measurement of your current eye glasses whether they are single vision, bifocal, trifocal or no-line bifocal (progressive) lenses. The Auto Refractor is a computerized instrument that measures the amount of nearsightedness, farsightedness and astigmatism with no response from our patients. The doctor uses the information from this instrument as a starting point in his evaluation of his patent’s eye sight. It is included in our yearly eye health exam as these values can change yearly due to growth, stress, disease and degeneration. Big Sky Eye Care utilizes the latest technology. This includes the FDT and Humphry Visual Field. The FDT is a Computerized Visual Fields Instrument to help detect early Visual Field loss. The Humphry Visual Field is a more in depth testing of the Visual Field. Dr. Beyer can detect more eye diseases with the use of this instrument than any instrument in our clinic. The findings from the tests done with this instrument enable the doctor to determine if there is any retinal disease and if there is any disease processes from behind the eye, all the way to the back of the brain.